The year is 1129, and at the Council of Troyes (Troy is a commune in north-eastern France on the Seine river), Pope Honorius II, on behalf of the Roman Catholic Church, recognized and confirmed the Order of the Knights Templar on January 14th. Who is the Order of the Templar? The Order of the Templar is officially named Poor Fellow-Soldiers of Christ and of the Temple of Solomon, but they also go by Knights Templar or the Order of the Temple. They are one of the most well-known Western Christian military orders of the Middle Ages, and consisted of up to 20,000 members at their peak, with roughly 2000 of those carrying the distinction of being knighted. Their knights were commonly recognized in their white mantles with red cross (which they wore at all times), and are known to be one of the most skilled fighting units that took part in the Crusades. The red cross was a symbol of martyrdom, meaning it was an honor to die in battle. The Templars built fortifications not only in the Holy Land, but across the entirety of Europe, and were heavily involved in economics, finance, and an early form of banking. 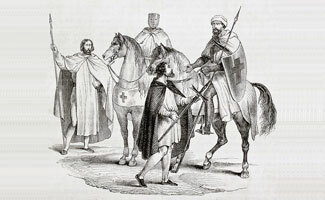 To become a member of the Templars, one had to take vows of chastity, poverty, obedience, and piety, in addition to signing over all material possessions to the Order. During battle, members of the Order were not allowed to stand down until their flag had fallen. Their reputation for skilled fighting capabilities, incredible courage, and dedication to their principles made the Knights one of the most feared combat forces during the Middle Ages. The Templar Knights were organized as a monastic order, with a Master of the Order for the Templars in charge of a specific geographic region (these included England, France, Croatia, Hungary, Jerusalem, and Portugal, among others). The entire Order was overseen by a Grand Master, who was in charge not only of the Templars’ military efforts but also their financial holdings. The Order of the Templar held strong for over 200 years, at the end of which, when the Holy Land was lost during the Crusades, came to a sad end. The knights were burned at the stake by King Philip IV of France, and in 1312 Pope Clement V disbanded the Order. Despite their abrupt dissolution and disappearance in 1312, or maybe because of it, the Order continues to exist to this day. Many of the buildings, fortifications, and temples that were built-in Europe still stand. Architectural insignia distinctive to the Order includes a horse with two knights, representing their poverty principle, and round buildings resembling Jerusalem’s Church of the Holy Sepulchre. The Order of the Templar lives on through various secretive and not so secretive societies today. The Freemasons of the 1700s use many of the Templar symbols and practice many of their rituals. Freemasonry is a fraternal organisation whose membership worldwide is estimated at around 5 million, with members in the United States, England, Scotland and Ireland. The freemasons share moral and metaphysical ideals, and the belief in a Supreme Being. Read our article on the Freemasons’ Secrets to learn more about this secretive society. Founded in 1804, the Sovereign Military Order of the Temple of Jerusalem (SMOTJ), with just over 5000 members, is an affiliated Grand Priory of the Ordo Supremus Militaris Templi Hierosolymitani (O.S.M.T.H.). Their principles are based on those of The Knights Templar, they take part in charitable works, antiquarian research, diplomatic lobbying and intervention, and strive to preserve holy sites in and around Jerusalem. In addition, the SMOTJ achieved United Nations NGO status as a charitable organization. There’s no doubt that at one point the Knights Templar were in possession of legendary Christian relics, including, possibly, the Holy Grail, the Ark of the Covenant, and a piece of the True Cross. The Shroud of Turin (the cloth placed on the body of Jesus Christ at the time of his burial) was publicly displayed in 1357 by the family of a Templar that had been burned at the stake in 1314. The shroud’s true origins and dating are still a matter of controversy and speculation.